A fter the success of the Cinnamon Roll Cupcakes, I was back in my baking mode... Eager to create, but already burnt out on the super sweet and the bacon-y savory, I was ready to try something that very much so skirted the boarder of the two lands. Noming on some strawberries with the bf, I started thinking about some other good strawberry combinations, since I've already done the very decadent Chocolate Dipped Strawberry Cupcake. Curious, I thought about my other love with strawberries... Balsamic! A risky move, but one with potential, a Balsamic buttercream perhaps? 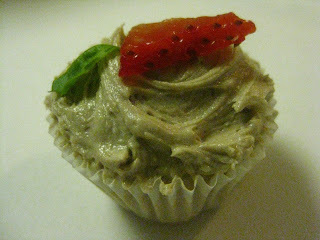 And thus the Strawberry & Basil Cupcake with Balsamic Buttercream was born! in a blender, blend half a package of strawberries with a half cup of basil. the mixture will look kind of gross, but will smell amazing, and taste even better. pour the mixture into the batter & hand mix together. fill cupcake tins 2/3 of the way full. like any basic buttercream, beat the butter until it's light and fluffy. slowly add the powdered sugar, balsamic and milk until you've reached the consistency and flavor you like. 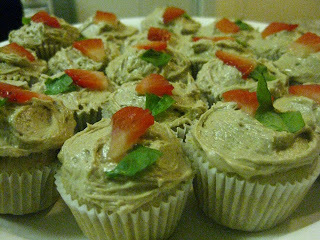 frost & decorate with leftover strawberries & basil bits!